Acne is one of the most common skin care problems seen by doctors. It occurs when follicles become clogged by a combination of sebum (oily substance produced by the skin), dirt and dead skin cells. If you have mild-to-moderate acne, topical treatments are usually sufficient. However, if you are experiencing more severe, widespread acne, our Kelowna skin-care professionals are able to develop a customized acne treatment to quickly and safely clear up your skin. 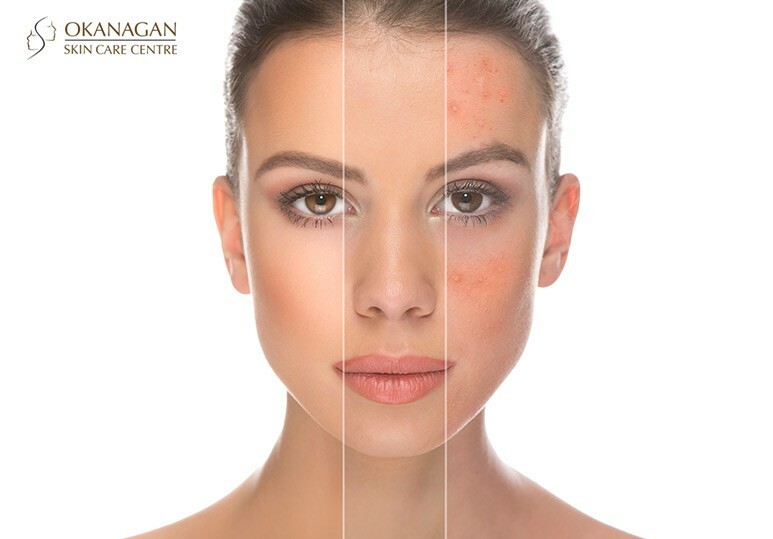 At Okanagan Skin Care Centre, we offer fast and effective acne and acne scar removal treatments for healthier, more beautiful skin. By using VISIA, a digital skin analysis system, we are able to create effective treatments specifically tailored around your skin care needs. What Are My Acne Treatment Options? What is it? This blue light photodynamic therapy is an advanced treatment for managing acne. It works by selectively targeting and destroying acne-causing bacteria which, if left untreated, increase inflammation and cause acne to spread. How often and how many treatments do I need? You will need 1-2 sessions per week with your treatment lasting at least 5 weeks. What is it? In this acne treatment, a topical solution called Levulan is applied to your skin and left on for an hour prior to the Blu-U laser treatment. Suitable for: More severe cases of acne. How does it work? Levulan will be uniformly applied to your AK lesions an hour before your Blu-U laser treatment. This is so the solution can penetrate the targeted cells. After 60 minutes, you will return for the second part of the acne treatment which involves treating your lesions with the Blu-U blue light. What are my Acne Scar Removal options? Acne affects almost all adolescents at some point in their life, but only a small amount of these patients will have lasting scars. Microdermabrasion is the process of removing the top layers of the skin using a wand tipped with diamonds. This encourages the growth of new skin cells and gives your face a much smoother look and feel, helping to reduce or eliminate visible acne scars. Chemical peels work similar to Microdermabrasion for acne scar removal except chemical peels use chemicals instead of a hand-held machine to removal the top layers of skin. Microneedling is a minimally-invasive, safe acne scar removal treatment which, through a hand-held device, employs 12 ultra fine needles to break down old scar tissue in your skin. It also stimulates the production of collagen in the treated area, leading to a healthier, more beautiful complexion. To learn more about the costs, risks and benefits of our Kelowna acne & acne scar removal treatments, contact our skin care clinic today at 250-868-9290 or book a consultation with one of our skin-care specialists.